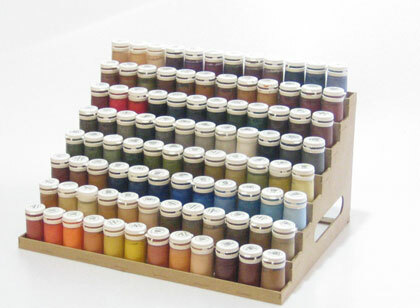 Today I got my second of these in the mail so I thought I'd do a quick review as I know from experience and from talking to fellow painters that racks which are able to hold one's paintpots are always sought after. 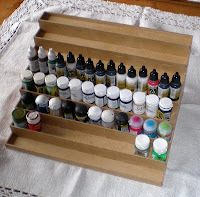 So let's have a look at my current weapon of choice, the Unnamed Paint Rack by Miniaturicum of Germany. The material is MDF in a natural wood colour (as far as MDF goes). 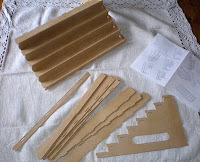 It's definately sturdy enough for our purposes, comes pre-cut and requires some assembly on your part. It comes with a simple paper sheet with instructions so there really isn't anything you can do wrong while assembling the piece. What's very nice is the way the pieces connect. You just put the parts together and the little tabs snap-fit into the slits (sorry technicians, I'm sure that there are way more correct terms for this but I hope that everybody still gets what I'm saying). Speaking of which, the fit of the single parts is excellent. On both of these racks I got there was no filing or cutting what so ever required. Really quick and comfortable to assemble (to weird people like me it's even fun). There is one part about this rack I prefer to glue (using just a bit of regular white PVA glue). It's the stabilizing two-part L-shape brace in the lower back. This one tends to fall off easily if you just stick it between the side panels. Actually, it isn't really required for the rack to stand properly but I prefer the extra stability so I glued those two pieces together and then fit them between the side panels. You could also glue them onto the side panels but I like the possibility of being able to take the whole thing apart again if required. Now let's talk paint. For demonstration purposes I put a number of paintpots of the most mainstream companies on the rack. One word on Tamiya Acrylics glass bottles - those are too large to be put onto this rack so watch out with those. This rack is available with four, six and eight levels. Personally I see no reason not to get the eight levels one but look at how many paintpots you have standing around and do the math for yourself. Also keep in mind that naturally, the more levels you get, the longer the whole thing is so if you have little space on your desk as is you may want to consider smaller versions. The eight level version is 30cm / 1ft. deep. If you don't have a constant painting space the whole thing is rather comfortable to move around without all the paints falling off and the pieces, even if you didn't glue them together, will stay together (apart from the brace in the back, see above). Now for one of the most important bits to many - the price. The eight level version costs €30.00 plus shipping which definately isn't too cheap but well-priced compared to similar products (like the Miniature Scenery ones or the Paintier organizers). 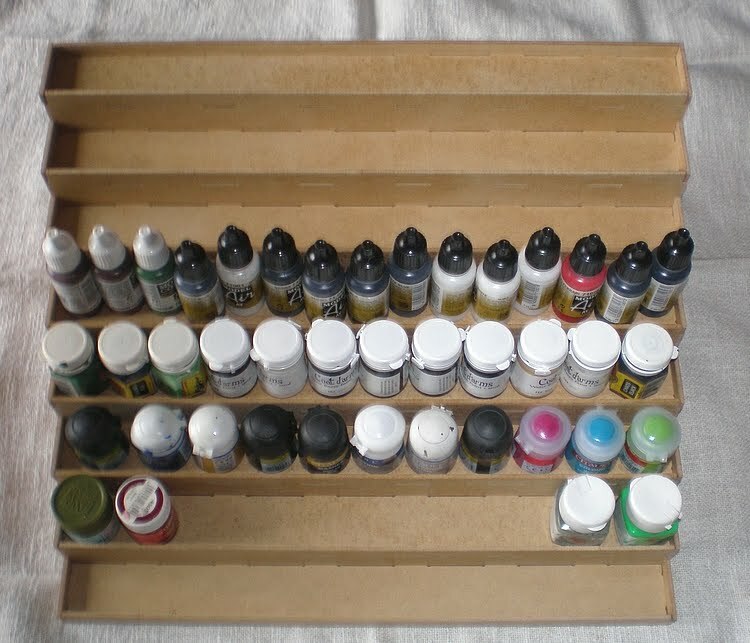 I have been looking for a decent paint rack for a while and even built a few myself until I bit the bullet last year and got my first Miniaturicum one. Never regretted it since and, as stated, just got my second one. 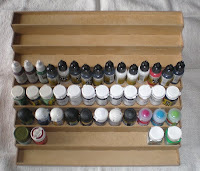 For me it's a very workable and flexible solution to paint pots standing in the way. I hope that this quick review was informative, possibly even entertaining, to you to read and helped you if you were looking for a quick and easy way to get a bit more order on your painting desk.